Ok perfumistas, give us a vote on Kenzo as a perfume house. Are you a fan? Not a fan? Or, like me, do you have nostalgic warm fuzzies for the good old days of dependable if not earth-shattering fragrances like KenzoAir and Kenzo Amour (or even farther back: Jungle L'Elephant), but look with some dismay on what seems lately to be little more than an endless stream of Flower and L'Eau Par Kenzo flankers? Wherever you fall on the spectrum, the new Kenzo World is not likely to radically shift your outlook. The sparse list of notes (red fruits, peony, jasmine and ambroxan) tells more of the story than it ought to. There is a fruit bomb opening (bright, sweet and loud), then a nondescript floral heart (what I think of as pink perfume flowers), then a woody - musky - ambery base (pale but mildly warm). There are whispers of greenery here and there, and a sour undertone in the early stages that was appealingly tart on some wearings, just plain sour on others. Verdict: It is lively and energetic, I will give it that, and it's reasonably wearable and youthful. But despite the exhilarating vision of Margaret Qualley shooting laser beams from her fingertips while dancing like a crazy person in the fantastic commercial from Spike Jonze, and despite the cool bottle and the new artistic directors at the helm,1 and despite the involvement of perfumer Francis Kurkdjian, Kenzo World still smells entirely bound by convention. All of Kenzo World's surprises are visual, not olfactory, and without smelling like a dupe of anything in particular, it manages to smell like any other modern fruity / woody pink floral. In that sense, it might be more appealing to women who don't shop for fragrances frequently, or who are more motivated by the advertising and packaging than the juice. As a Kenzo fruit bomb, I do not like it as well as the recent-ish Flower by Kenzo L'Elixir; as a mainstream Kurkdjian, I do not like it as well as My Burberry; and for a perfume in an eye bottle, it can't touch the lovely but long gone La Perla Eclix. The quick Kenzo poll: name the three fragrances you think anyone new to the brand ought to try. 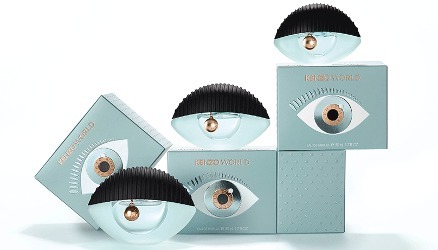 Kenzo World is available in 30, 50 ($86) and 75 ($100) ml Eau de Parfum. In the US, it is currently exclusive to Bloomingdales. 1. Carol Lim and Humberto Leon joined Kenzo in 2011, but reportedly this is the first Kenzo fragrance under their creative direction. The only perfumes I have from this house are the original Kenzo Flower and Kenzo Amour, and although I liked both fragrances, I still have the original bottles and I rarely wear either of them. I have never even sampled any of the other fragrances. Thus, I can’t say much about the house as I am only familiar with two of their scents. I really liked Amour but I never reached for my bottle of the gold one (can’t remember now which flanker it was) either. Agree wholeheartedly with the review. This one was a biiiig disappointment to me. It’s really a perfect example of style over substance: all of the budget clearly went to that exciting commercial instead of the juice. I like my Kenzo Amour Le Parfum quite a bit (that’s the gold one, Robin! ), but would say Kenzo has been pretty weak on the fragrance front for a few years now. It’s like they sent one memo to Spike Jonze and an entirely different message to Francis Kurkdjian! Yes — Le Parfum. And I did like it too, but did not reach for it as often as I should have so eventually gave it away. I have some UFO, which is odd but not off-putting. And, from the sounds of it, probably represents that little movie better than World. If you come across it, you should try it. I also have a delightful thrifted mini of Ete, and would love to stumble into some Air. And…that’s all I know. That was a great scent. Really hoped they’d release it again but they wimped out with Madly Kenzo. It’s been years since I smelled Parfum d’Ete, I should try to find a tester. I loved Parfum d’Ete in the mid- to late-90s… went through several bottles of it. Haven’t smelled it recently, though. I sniffed World in Bloomingdale’s and I was very disappointed. There’s often a serious disconnect between the advertising & the juice, but this one is more severe than most. It’s hard not to be disappointed just on that basis alone. I’ve sampled quite a few but the only Kenzo I really like is the Elephant. And they really should bring that back for some anniversary, in an elephant shaped bottle — the trunk can be the cap. Nothing ever struck me until Oriental Flower (or whatever its real name is). I am actually wearing something similar today, namely DC’s Oriental Lounge. Both are like a lightweight cashmere scarf. That was a good one, they really should bring it back. I like that there’s a new category: perfume that comes in an eye bottle???? I only own Kenzo Amour and like it a lot. I preferred the Tiger to the Elephant but I like the Elephant bottle better. I suppose one *should* smell Flower for powder bomb reference, though it’s never grown on me. I would still like to smell d’Ete. Ha — and someone reminded me of Eclix in the announcement for this one. I wish I’d bought that one eons ago, when I still could. I looked at the bottle on line. It’s definitely a more mature eye than the Kenzo, but I like the colors in the Kenzo. I like the Kenzo color too, although it doesn’t fit the juice. Weird coincidence how both bottles have ridging along the cap. I like the bottle, but it has been years since I really liked a Kenzo–probably the Eau de Fleur series. Amour, Flower, and Ca Sent Beau or l”Elephant. Not my favorites (Air, King Kong, and Unidentified Fragrance Object) but a good over view of the brand’s heyday. I was surprised that series ended as soon as it did! and… Power! Wish this one got more love. Power never even got a flanker! Kind of odd. Hm, this came before I fell into perfumes, and looks pretty cool. Still available for cheap on Amazon, but I’m not a blind-buyer. Thanks for the review. I loved the ad, such welcome relief from writhing (and buffaloes). I haven’t tried the fragrance itself. I will, just to make sure. The Kenzo’s I liked were Ça sent beau!, Parfum d’Eté and Kenzo Air. Loved the bottles of Amour and Flower, and would admire L’Eléphant on others, but can’t bear it on myself. Do try it. There is only one review on the Bloomies site so far, but it’s glowing. Is yours the EDT or the cologne? Please elaborate on the scent if you can. I’ve been dithering about buying a bottle on the ‘bay, since forever. Thanks Nathan! Very informative ! Ca Sent Beau x 3 for my pick, not that I’ve smelled the entire oeuvre. If CSB was released by a darling niche house people would be all over it like a rash. Tangerine orange beach ball with a side of tuberose and spice. They really ought to do something to promote it, and I’m surprised they don’t. Actually I’m surprised it’s still in production given how little they do promote it. They used to be at least fun, wish they’d get that back. Never did try Totem & don’t think it even made it to the US. About two years ago, I fell in love with and bought Amour. Two weeks after, I came down with pneumonia, and was in bed for weeks. Now, even the thought of Amour, makes me feel sick. Hopefully in time, the association will diminish. I do really like the Flower Elixer. I don’t really care for the Kendo World bottle, it freaks me out. Oh, so sorry! Put it away for a few months maybe. I have and enjoy decants of UFO and Kashaya (which is loud and tacky and yet it’s occasionally just right). Would like to try Parfum d’Ete one of these days. I totally forgot Kashaya existed! And I never tried it. No Kenzo FBs and any samples I get end up either forgetten or marked for freebiemeet. One of my first decant purchases from STC was that of Jungle Elephant and I recoiled from it on first spray. The decant is in purgatory because I may eventually get around to trying it again when my nose matures which is probably never; it may be time to let it go. I probably would have skipped this review. Have I mentioned I am really not interested in this brand? A perfumista pal gave me a Baggie with a cotton ball sprayed with L’elephant over a year ago. I stuck it in on of my bureau drawers. You know, I can still smell it when I pull the cotton ball out from the Baggie. Now that is impressive! Very impressive! Betcha Angel would do the same. And you never know…there are fragrances I am apparently never going to come around to, but there are just as many that I swore I could never like and now I do. Can’t hurt to try a few! I haven’t tried World yet, but I love the commercial so this is sad. I have some Kenzo fragrances, Summer, which is a calm and milky flower scent, very nice. The raspberry bomb Flower l’elixir, and this I love. Kashaya, and this really has Sophia Grojsmans DNA. Very vanilla/stewed fruits/peach. A fun scent. I also have a bottle of Jungle elephant but rarely wears it. It has been the signature scent of a good friend since we were at uni and shared apartment in the middle nineties, so it always feels like I’m borrowing when I wear it. Someone new to the brand should try Jungle elephant, the cold and spicy Air, and if possible Flower oriental and Flower le parfum. I never liked the original Flower, but I wish they would bring these guys back. It was easily the best commercial this year — wish they’d gone a little edgier with this one. But maybe you’ll like it better than I did! I like appreciate Kenzo very much. They have some interesting fragrances and very creative packaging. Not all of them are great, but none of them are obnoxious, which is an accomplishment in these days of overbearing musks, spiky woods and overdoses of Iso E Super, Ambrox, etc. Amour is my true amour. I have a few others, such as Pour Homme in the pebble-shaped Ryoko spray. I have a soft spot for 7:15 in Bali because of the name and images, as well as the light, pleasant, uncomplicated scent. It was a shame they stopped all the travel retail series like 7:15. Jungle Elephant is NOT my friend. I’m repeating myself but Amour needed a better “intense” flanker. Gosh, had totally forgotten there was a Jungle Homme! Thanks. I love UFO and still kick myself for not getting a bottle back when you could. I also like Amour and the Indian Holi version as well as the new Elixir. If that one hits the discounters, it will be hard to pass it by. UFO seemed so crazy expensive at the time! Now, not so much. Amour, Flower le Parfum and Parfum d’Été were the only ones I loved. The only one I still have is Amour. I do agree that more budget went to commercial rather than scent itself. Saying that – it is not a bad perfume at all – only hardly anything new. The ad was a big BANG and perfume – nothing unusual, nothing that I did not smell before. On a first sniff – reminds me of a J’adore Dior and then longer I wear it, there are hints of d’Ete although not as sickly as Parfum d’Ete used to be.